A black and white photograph from the 1930s shows a young boy proudly clutching an out-sized paper cone. It serves as a lead image for one of the Jewish Museum Berlin’s excellent online exhibitions. In the English version of the accompanying text, the Zuckertüte becomes ‘a cone full of candy’, a translation of the object’s material function rather than its cultural associations. In the German-speaking world, a Schultüte is given to children on their first day at school; the ritual is not complete until a photo is taken of the new schoolchild proudly, or anxiously, clasping the Tüte. To a German viewer, the photograph therefore signals the self-evidence with which this Jewish-German family occupied its place in German society – an effect heightened by the motif printed on the paper cone: kitsch images of a boy and girl in decidedly non-Jewish, Bavarian dress. Today, #Schultüte and #ersterSchultag are popular Instagram hashtags. This continuity of cultural practice invites the German viewer to relate the Jewish boy’s experience to the here and now: What would the social exclusion of a schoolchild mean today? Along with other examples from history museums, the Schultüte got us thinking about what translation does at the museum and, more intriguingly, what it does not do and what it might be able to do. Like subtitling and dubbing, museum translation sets necessary but artificial restrictions on word-length and format. An exhibition board is not the place for lengthy glosses, or for contextual information about social values and practices. Exhibition texts in English also have to work for a global tourist audience, which means that finding UK or US comparators is not necessarily an option. Our academic work, being carried out at the universities of Exeter and Liverpool, focuses on museums about Germany’s 20th-century history. As part of a larger project on Germany’s ‘Memory Mainstream’, we have begun to identify areas where there is potential to enrich the visitor’s experience by translating more than the source text. As identified by translator Allison Brown, the challenges of translating historical terminology for museums include the need to understand the currency that words have among historians and the need to envisage the gaps in English speakers’ historical knowledge.1 We find that cultural knowledge is not only a question of proper nouns and propaganda terms; authors writing in German use the temporal adverbs noch, schon and erst (‘still’, ‘already’, ‘not until’) to express their sense of how late or early a historical event occurred in relation to its background. If a writer states that something happens ‘already in 1929’ or ‘as late as May 1933’, he or she assumes the German reader’s knowledge of the politics of the Weimar Republic and Hitler’s accession to power in January 1933. This can indicate, for instance, that the person being written about was an out-and-out Nazi. An admittedly unscientific survey of students suggests that these chronologies are less firmly fixed in British minds. Beyond terminology, we also see objects, museum names, museum architecture and Germany’s memory culture as translatable (but currently untranslated) aspects of the museum. In what sense do objects need ‘translating’? Museums already routinely verbalise the function and meaning of historic objects, where these are no longer self-evident to a modern audience; while Jewish museums regularly ‘translate’ objects for a non-Jewish audience. As the example of the Schultüte shows, gaps open up where museums see no need to translate an object because it is still known to the home audience. The German-Russian Museum in Berlin shows a tin of ‘frost salve’ to illustrate how hopelessly ill-equipped German soldiers were for the Russian winter. Museum scholars understand that when we view objects behind glass we engage our other senses (touch, smell, hearing) based on our prior knowledge of the object. In this case, a German viewer can ‘feel’ the insubstantial weight of the little tin of cream because this kind of tin is still sold in German supermarkets. With nothing similar in British shops (a plastic pot of Nivea is bigger and heavier), that effect cannot be communicated to a non-German viewer – at least not without translation. Germany’s museum boom has created a colourful array of museum names which are self-explanatory to educated Germans, and baffling to outsiders. A museum may be called a Denkort (‘place of reflection’), Erinnerungsort (‘place of remembrance’), Mahnmal (‘memorial’), or Dokumentationszentrum (‘documentation centre’). This last term evokes nothing very definite when calqued into English (perhaps a data collection service? ), but represents, in Germany, a strong commitment to a historian’s account of the past, based on the rigorous use of archival sources. This ambition is also often expressed through architectural design, an aesthetic that can best be described as an expensive-to-achieve sparseness. Perhaps the most baffling museum title is the ‘Topography of Terror’ documentation centre, calqued from the German Topographie des Terrors. This was coined as a name for the remnants of the SS and Gestapo headquarters, and an improvised exhibition was created on this site in the late 1980s. At the time, the organiser could not have known that ‘terror’ would take on a new meaning in English after 9/11, but even prior to that, the English word never had the sense it has in German: the state’s intimidation and terrorization of its own citizens. 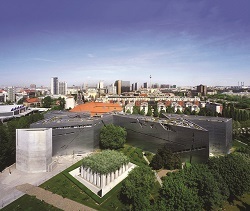 Arguably, the institution benefits from the neat equivalence of its German and English titles, which makes branding easier, and in practice tourists remain resolutely untroubled by the strange name – the Topography of Terror is a must-see attraction in Berlin. But to the English ear there remains an incongruous contrast between the sensationalising alliteration that conjures up a tabloid headline and the high-register, academic connotation of ‘topography’, an ambition that is matched by the minimalist architecture of the centre and the earnestness of its displays. Would anything be gained by a more transparent translation, such as ‘Documentation Centre for the Sites of State Terror’? Probably not, but this linguistic slippage would make a useful discussion for a guided tour. More broadly, we are interested in the gap between what Germany’s memory culture means to citizens who have grown up with it and what it means to outsiders, who may only vaguely know that Germany has started ‘facing up’ to its past. Indeed, they may imagine that Germany has always documented the Nazi past, in which case they may find some of the displays of recently ‘unearthed’ objects (which symbolize the return of a repressed past) puzzling. In some cases, such as the Topf & Sons site in Erfurt, where the crematoria ovens for Auschwitz were made, one has the feeling that the whole museum needs ‘translating’, as the product of certain trends in German memory politics. At sites in eastern Germany where the National Socialist past was overlaid by the GDR dictatorship, the layers of cultural and historical memory become even more complex and interwoven, and the challenges of their translatability for the outsider all the more intractable. As part of our research project, we envisage using a small online showcase to experiment with more layered forms of museum translation. Currently we know relatively little about the working practices of translators who work for history museums. Examples from the exhibition space suggest to us that translators work with text only, without images of the objects they are captioning. We also assume – although we do not know – that few (if any) translators specialise in museum translation and that for most translators a set of exhibition texts is one job among many. We would be very interested to hear from translators who have translated exhibition texts for museums: c.paver@exeter.ac.uk or matthew.philpotts@liverpool.ac.uk.